Continued cold weather, chilly waves can trigger dryness of skin. 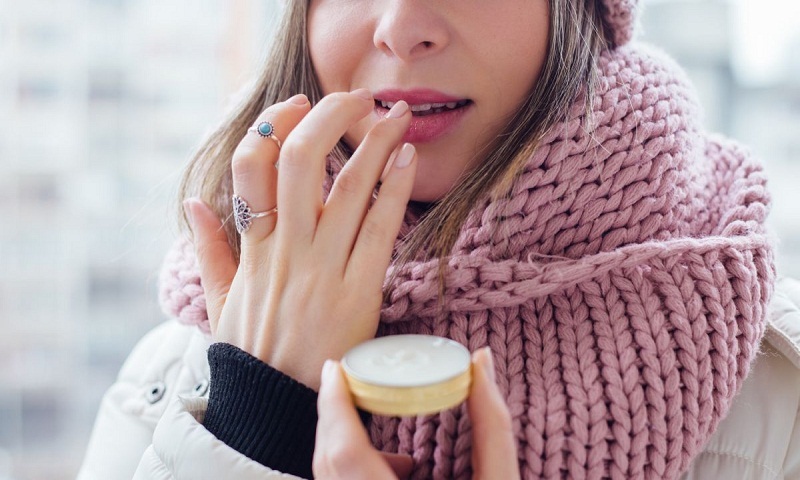 Chapped lips, red and cold-wind-burned cheeks, dry scalp, rough hands, cracked feet are some common areas of extreme dryness in the winter season. When the body is exposed to cold air, it attempts to conserve heat by shrinking blood vessels which drains your skin of moisture leaving the surface to dry out quickly. The subsequent dry skin can be painful, less supple and less elastic. So it becomes more vulnerable to irritation and infection. Instead of testing and trying new hacks every now and then, start with basics. Hydration and moisturising is the basic need of your skin. Face: To maintain your skin’s natural moisture barrier, switch to a non-foaming, cream-based or oil-based cleanser that is preferably unscented. It will help moisturise your skin and replenish its natural oils. Look out for these key ingredients when buying a creamier cleanser – glycerine and hyaluronic acid. All of these ingredients work to bind water to your skin, which will better hydrate your face and prevent damage throughout the day. After cleansing, apply a vitamin C serum. It gets absorbed by the skin quickly and deeply as it is made of very small molecules. Vitamin C content increases skin elasticity, stimulates collagen synthesis and boosts the skin’s immune system. It also repairs damages caused by external factors. Vitamin C serum is high in antioxidants which may lead to increased water absorption in your skin. Use a light-weight moisturiser enriched with coconut butter. It will not only keep your skin feeling supple and well-protected, but also give it a radiant glow. Up to 80 per cent of the sun rays can lead to moles, wrinkles and skin cancer even when skin is exposed to snow, light clouds and fog. To avoid this, use a sunscreen with an SPF of at least 15, with UVA and UVB protection. Do not forget to reapply often. Lips: You do not have to bear dry, cracked, peeled or even bleeding lips all winter long. Start with exfoliating them gently. It can do wonders for achy, dry lips by sloughing away the dead skin cells. Take a soft toothbrush and gently scrub your lips with it. Repeat it twice a day when you brush your teeth. You can also mix little honey with sugar and almond oil to rub gently on your lips. The dead skin will vanish gradually providing moisturising. Then use a lip balm made with bee wax or coconut oil. It will give your lips extra protection and moisturising while healing and protecting them. These lip balms create a seal on your lips that blocks out the drying elements in the air. Also, they contain anti-inflammatory, antibacterial and antioxidant properties which allow them to heal wounds including cracked lips. Bee wax and coconut oil both are a potent source of moisturising and can even help to lock it once applied. If your lips get dry, do not lick them. This might be difficult to follow but do you know that licking your lips actually dries them out faster. The saliva that gives momentary relief actually takes along with it any moisture that may have already been there. Your lips end up even drier and worse. Hands: Wash your hands with natural soap. Avoid chemical-laden soaps by choosing one with a vegetable glycerine base or liquid castile soap. Be sure to check ingredients. Then go straight to the source for moisturising them – nourishing oil without putting the other crap on your skin. There are many kinds of oil that work as great moisturisers. Coconut oil is the most popular with its antioxidant and antibacterial properties. It gets absorbed into the deeper layers of skin-strengthening tissues to make it look firmer. Other options are grape seed, jojoba, sweet almond and olive oil. However, coconut oil seems less greasy than others. Apply oil on your hands before bed also and put on cotton gloves to keep the moisture intact. You should exfoliate your hands twice a week with a scrub made of brown sugar and sweet almond oil. Avoid excess washing of your hands with water and soap. These two are the major culprits of dry and cracked hands. Feet: Wash your feet with a non-foaming cleanser preferably in cream or milk form. Use a pumice stone to keep the skin soft. Moisturise them when they are still damp with petroleum jelly, glycerine, jojoba oil or Shea butter. Heal the cracks of your heels by using chemical exfoliate cream that contains lactic acid, urea or glycolic acid to slough off dead skin cells. You can also dip your feet in a tub of warm water mixed with half a cup of lemon juice. After moisturising, wear soft cotton socks. Avoid wearing woollen socks as they may remove natural fats from the skin while rubbing your feet. Never walk barefoot. It adds on drying out your feet. Always keep your socks and slippers on. Apply grapeseed oil before going to bed and put on socks again so as to help the oil penetrate your skin the whole night. Hair: After your skin, your hair has to bear the burn of cold weather. Whatever hair problem you are facing in winter – be it dandruff or fizziness of hair, the root cause may be lack of ample nourishment. To nourish your hair deeper, oil your scalp and hair regularly with coconut-based hair oil. It will keep the moisture levels up and the dryness at bay. You may also use a botanical spray with chamomile extracts to escalate lustre in your tresses. Chamomile is an exceptional ingredient that increases the melanin level in roots of the hair and thus delays the process of greying as well. Use a mild shampoo to clean your hair. Wash your hair with warm water and not with hot water. Hot water takes away the natural oil of your scalp leaving it completely unnourished. Also, it opens up the pores of your scalp which leads to absorption of worse external elements harming it badly. Skin is affected so much by the weather because it is literally the body’s first line of defence against outside elements. But for the barrier to function properly, the skin needs to maintain the correct levels of moisture and natural oils. Have no fear, these easy winter skin care tips can help you prevent and treat dry, chapped skin. Besides all these remedies, make sure to drink at least two to three litres of water every day. This will keep you well-hydrated throughout the day and avoid dehydration which in turn may help in keeping your skin hydrated inside out. Take shorter baths and showers. Use warm water instead of steamy hot, because hot water removes skin’s natural oils more quickly than warm water does. Once you are done with bathing, never rub, always pat dry. Keep smiling all season long keeping your skin’s health and wellness unharmed.